AAA Trimming is a small car interiors Gold Coast business with personalised service. We ensure your car interior needs are met and you are given the best result at the lowest price! Jason King established AAA Trimming in the early 1980s as a mobile Auto Trimmer. The business has had very impressive growth which has been mainly due to word-of-mouth referrals from our many satisfied customers. Jason’s friendly service and attention to detail have been the foundation of this sensational businesses growth. 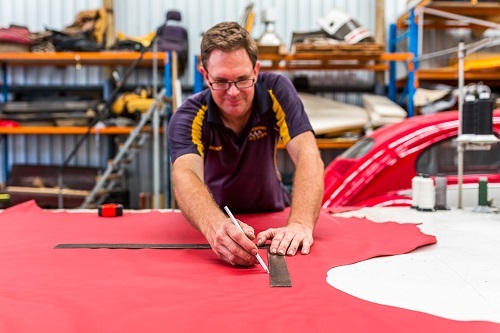 Jason is a qualified automotive trimmer and aviation upholsterer, with CASA accreditation to undertake trimming and upholstery on aircraft. We understand the importance of being fast and reliable and therefore offer a prompt and competitively-priced service. From hood linings and soft tops to new carpets and full new leather interiors – AAA Trimming can do it all! We always ensure that every job is done once and done right! Just look at some of the examples. For professional car interiors on the Gold Coast, Call Jason now on 0418 986 609. See Our Expert Team Today.